Sometimes you need to set a gap between two components in your car, for instance when checking your spark plugs, doing a valve adjustment, or setting the distributer. When you need an exact gap, thickness or 'feeler' gauges are the perfect help. Find out the gap of what you're trying to adjust from a manual, help guide or the ever helpful internet. 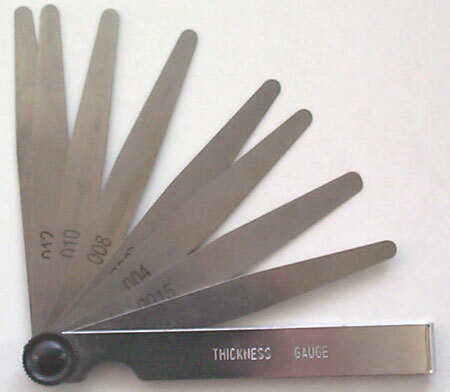 Each of the blades of the thickness gauge has a different measurement on it, e.g. .025, .0015 (very thin), etc. Separate the one you want and fold the rest away. Some gauges have a knob where they all hinge which you can tighten to keep the blade you want locked in place. Slide the measuring blade in to the gap you want to set, then move the machinery you're adjusting in to it's just touching the gauge, the move it out just slightly. What you're after here is to not quite grip the measuring blade - it should be able to just slide in and out. Don't use the machinery to clamp it in, as that will actually be too small a gap and also you'll dent the soft metal of the blade. Once you have the gap set so you can just get the blade out, tighten up the machinery a bit, but not to full tightness. Now double check you can get the blade in but it doesn't rattle, and you can't get the next size blade up in the gap. If it's still right, tighten up the machinery the rest of the way. Don't forget to fold away the blade before putting the thickness gauge in your toolbox, as they're easily bent.